On Sunday, October 10th, 2010 (i.e. 10/10/10), 1Sky is co-sponsoring a Global Work Party with 350.org. First, a bit about what’s up with the number 350; it symbolizes the parts per million of CO2 in the atmosphere that our climate can probably tolerate without catastrophic disruption (we’re already above that, so we have a lot of work to do). So what’s the Global Work Party? The idea is rather than march or gather for a big photo, we actually do something with our friends, our neighbors, our communities. Hundreds of events are planned all over the world, from tree planting in the Philippines to a bike rally in Dharamsala to cleaning up a creek in Texas. No matter where you are, you can probably find an event that is already planned. In addition, there’s still time to organize your own. I think a good event has two components: it should build community and reduce CO2 at least a little bit. A good photo opportunity is also nice. There are lots of possible ways to do this: carpool (if you happen to work on Sunday); plant a tree; work on a community garden; and so on. Here’s an idea that I think incorporates some important aspects. Get 350 Compact Florescent Lightbulbs (CFLs). You can either buy them or you might be able to get the conservation department of your electric utility to donate them. These bulbs are one of the easiest and cheapest way to reduce our electricity consumption, which in the U.S. is the largest source of our greenhouse gas emissions. If you are reading this, I’m guessing that you already have a bunch in your house. But your neighbors may not. So on 10/10/10, go knock on your neighbor’s doors and offer to come inside and screw in a bunch of free CFLs for them. Talk with them about your concerns, about how important it is for us to drastically reduce our energy consumption and CO2 emissions. Talk about what’s happening in your community. If there’s nothing happening, talk about starting things. Go from house to house. Bring a bottle of wine. It should be fun. Invite your first neighbor to join you at the second neighbor’s house. Make it a rolling block party. Have fun! The most important thing is for everyone to understand that this is but one step, for some the first, for others just another step in years of work. But for no one should it be the last step. Getting people signed up for updates from 1Sky and 350.org is a good step, but getting people involved in what’s happening in their community is best. Andy Silber is a astrophysicist, engineer, project manager, husband, father, and energy activist living in Seattle. Visit Andy's blog on Sustainable West Seattle. The author's opinions do not necessarily reflect those of the 1Sky campaign. This past month has been such a whirlwind of actions for the campaign! We hit the ground running with shadowing events all over the country to hold Congress accountable for their inaction in climate. Many of you went above and beyond, leading in your communities during the congressional recess. After 45 minutes of demonstrating outside the first fundraiser, the protesters marched past the offices of both Senators [John] Kerry and Brown on their way to a second fundraiser... Then, just as the demonstrators were told that "security had been notified," the improbable happened: Senator Brown approached the restaurant on foot. Seeing her chance, Susan immediately went to the senator's side to voice her request for strong climate legislation. Susan and Brown spoke for nearly a minute before the senator waved to the other activists and disappeared inside. On Wednesday, I attended the Americans for Prosperity (AFP) anti-RGGI rally in downtown Manhattan. For those of you who may not be familiar with AFP, they describe themselves as "...an organization of grassroots [emphasis added] leaders who engage citizens in the name of limited government and free markets on the local, state and federal levels." Sounds innocuous enough, right? Well, think again. AFP has its sights set on dismantling the most successful regional greenhouse gas emissions reduction agreement in the country: the Regional Greenhouse Gas Initiative (RGGI). On Wednesday, about one hundred sign-wielding protesters arrived in two luxury charter buses bearing the name Citigroup in front of the so-called "clandestine" offices of the NYS Department of Environmental Conservation (DEC) to protest the RGGI auction taking place "secretly" inside. The protesters claim that the RGGI and other cap and trade agreements like it are nothing more than a "secret tax" that will "kill jobs" and "cap our energy production." They also claim that RGGI does nothing to protect the environment and therefore, "even environmentalists should rise up against RGGI." On Monday of last week, in front of the Chamber of Commerce in Palm Beach, Florida, Senator George LeMieux spoke about the need to support small businesses, as Florida is primarily a small business state with no fortune 100 companies housed here. When he was finished, I was the first person to shoot my hand up in the Q&A session. I introduced myself as a representative of Southern Alliance for Clean Energy and thanked him for his thoughtfulness on our economy and his support for clean energy initiatives, which he had also mentioned in his speech. I also asked him if, considering all of his support for clean energy and for small business, he would also support a cap on carbon that would generate revenues from Big Energy and distribute them to clean energy businesses, which are primarily small and growing. The senator talked a long and good game about supporting the Lugar bill and tax breaks for clean energy, but ultimately clarified that he does not support a price on carbon as he has been informed that this would cause a 35 percent increase in energy costs. In his answer, LeMieux also identified himself as a staunch supporter of investing in nuclear power, which he defined as the "cheapest clean energy" source on the market. While we would not define nuclear as clean from the environmental costs in terms of water and waste, as well as the health costs of Leukemia traced to neighbors of transmission lines and reactors, it's also important to point out that nuclear is actually really expensive. In fact, according to a study from Duke University, solar is less expensive than nuclear now. Solar power has been on a trajectory to become less and less expensive, and 2010 is the year in which finally it surpassed nuclear as a more affordable option. The most important takeaway from this day was that Senator LeMieux came out publicly against a cap on carbon. This was the first time climate solutions advocates heard the senator take a position. While the senator supports clean energy tax breaks and investments, all of which will jumpstart our green economy and curb carbon emissions, I was disappointed to hear he does not support a cap. A cap on carbon is the only way to ensure we can control cutting greenhouse gases within the timelines we need, in the timeframe outlined by scientists. More than 90 people have signed up through 1Sky and our partners 350.org and Energy Action Coalition to be involved with shadowing Colorado’s senators during the August/September recess. And thanks to the primary elections in Colorado on August 10th, opportunities for shadowing around our beautiful mountain state over the last week have been numerous, and we’ve turned out supporters for at least five events. Colorado Senators Mark Udall and Michael Bennet have proven they care about the climate crisis and understand the benefits of transitioning to clean energy. Both voted to protect Clean Air Act authority to regulate carbon emissions (i.e., opposed Sen. Murkowski’s 'Dirty Air Act' resolution) and both expressed their disappointment in written statements for the Senate's failure to pass a comprehensive climate and clean energy bill. Sen. Udall was also pushing hard for inclusion of a national Renewable Energy Standard (RES) through an online petition that garnered over 2,500 signatures. So we’re giving them our thanks for these actions and encouraging them to be even stronger leaders on these issues when they’re back in Washington. 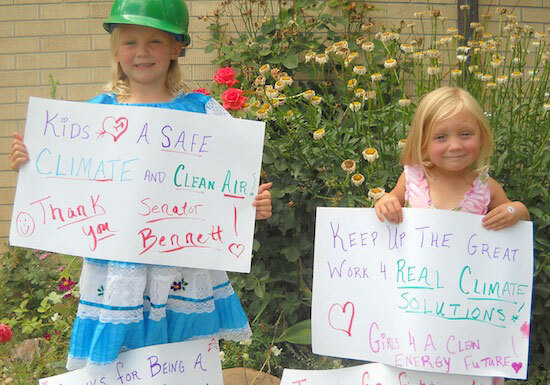 Volunteers (including my daughters pictured below) showed up for a kick-off rally for Sen. Bennet’s 24-hour Colorado tour with signs thanking him for being a climate and clean energy champion and urging him to keep fighting for a real climate bill. As Sen. Bennet emerged from his tour bus, he made a bee line straight for my little ones, gave them hugs, read our signs (we were the only ones there with signs other than the standard campaign signs), and then nodded his acknowledgment. If you have ever tried to talk to a family member, friend, or plane seat-neighbor about climate change, you know the unique challenges that this offers. As someone who works in the climate movement informing people what is going on and what they can do, I'm right there with you. Recently I came across a great, accessible paper from the Climate Leadership Initiative (CLI) on just this issue that can help us both. "Hands Across the Sand" a huge success -- thanks to you! Volunteers give Sen. Brown the "Oily Bird Award"
Last week, I sat with filmmakers at Working Film’s Reel Engagement seminar, described as “an interactive retreat powered by bold non-fiction filmmaking and strategic, on-the-ground organizing locally, globally and on the Web.” Working Films put together seven very powerful films that tell stories of our modern climate and environmental issues, from "clean coal" to mountaintop removal to natural gas extraction to international climate crises to the Cape Wind project. Visit Working Films’ website to watch some of these trailers -- really gripping pieces. Find out more about this exciting 1Sky/350.org merger and how you can stay involved with the climate movement at 350.org.